Noodlecake Studios has released some information regarding their next title, Lunar Racer. According to Noodlecake co-founder Jordan Schidlowsky, “Lunar Racer is going to be great…it’s got multiplayer and it’s been described by some of our test users as ‘Tiny Wings meets Mario Kart meets Death Rally‘. 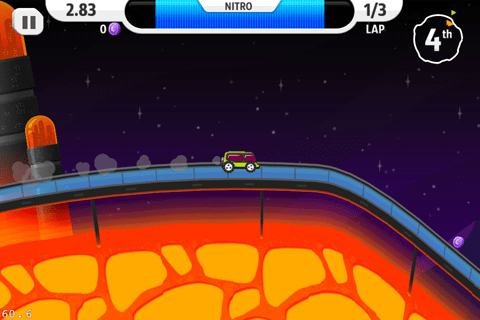 Lunar Racer is a multiplayer 2D racing game with three distinct controls. A gravity booster which increases gravity so you can pull your vehicle down faster (the similarity to Tiny Wings). A nitro booster which give you some extra thrust out the back of your vehicle. And finally, there are the tilt controls which allow you to rotate your vehicle. All the vehicles are auto-drive, so all wheels have the same initial driving force. 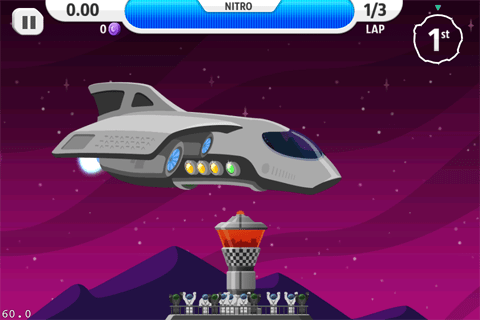 Tthe key to the game is to perform tricks, which will (in turn) fill up your nitro tank. Using nitro boost drains you tank, but doing flips and other tricks fills it back up. The rest of the game is where the similarities to both Mario Kart and Death Rally‘ come into play. You compete against other vehicles picking up special ‘powerups’ (ala Mario Kart) When you hit one of these powerup spawn points, you are randomly bestowed one of the special powerups. These include different missile types, bubble shields, extra nitro, mines, etc.. That’s just the basic gameplay as Jordan was quick to point out that there are many more details which have yet to be revealed. I’m personally hoping that one of these turns out to be another Whitaker Blackall soundtrack. There is no release date yet, but Lunar Racer is pretty close to being finished and the Noodlecake team hopes to complete the game in the next month or so. I’m hoping to get an early look at the game soon, but in the meantime, enjoy the screenshots below. To celebrate the upcoming release. Noodlecake has dropped the price of the paid version of their amazing golf game, Super Stickman Golf to FREE for a limited time. If you missed out on the last time it was free, I highly recommend grabbing it NOW, you can read my full review here.